* Note - Mizuno Edmonton Half Marathon course has been revised. Please visit our "Route Map" page for further details. 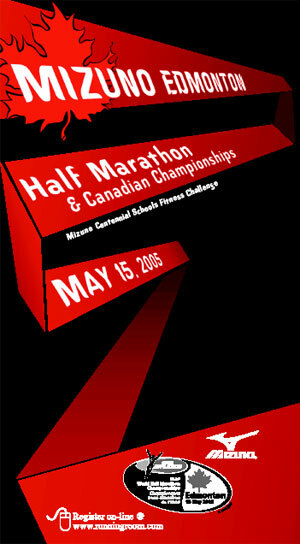 Sunday, May 15, 2005 - 8:00 a.m.
Mizuno Centennial Schools Fitness Challenge (1500m) May 15, 2005 (no entry fee, registration still required) Any school-aged youth or group welcome. All finishers will receive a finishers medal (no-tshirt). Parking available at the U of A Stadium Car Park at 89 Ave and 116 St. Shuttle Buses will be stationed along 89 Ave. No parking available at Hawrelak park. Click here for 109 St. Running Room location!